Seattle designer Katrina Hess makes superb coats to help cyclists stay dry. Designer Katrina Hess’ line of bespoke rain gear was inspired by the avid cyclist’s simple need to stay dry when riding during our wet and wild weather. Uninspired by outerwear she saw on the market, this intrepid former graphic designer rolled up her sleeves and made her own coat to fulfill her needs. That was two years ago, and since then, Hess has been crafting Made in Sodo coats with intelligent modifications for bikers. The brand’s Martial Law military coat, in men’s and women’s styles, starts at $375 for an unlined, waxed canvas shell with a high cowl. Added details, such as a detachable cotton lining, venting for increased air flow, “performance” mesh material to wick away moisture, reflective piping, a hood and thumb-hook arm warmers, all cost extra. While the majority of the coats have been made for everyday wear, the designs are geared toward urban cyclists. “Many of our customization options have evolved from their unique specifications,” Hess says. 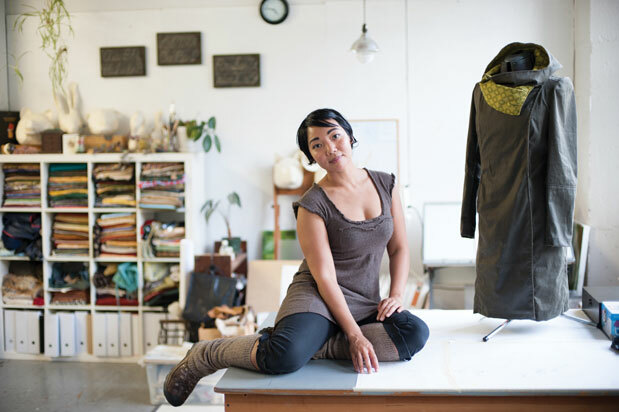 “Every time I figure out a new customization, I’m happy for days.” Each Made in Sodo coat is made to order, which means you can bike with the crowd and completely stand out from it.